March 4, 2014 — PINECREST, Calif. – This past weekend, March 1st & 2nd, the Dodge Ridge Race Team traveled to China Peak for this annual stop on the Far West Central Series tour. 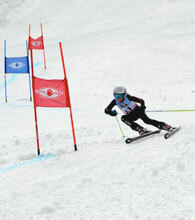 Competitors from China Peak, Badger Pass, Bear Valley and Dodge Ridge all vied for the top spot as the Dodge Ridge Race Team’s strong results secured the overall series team championship. Even with one final stop left on the Central Series tour, this win at China Peak brings the Silver Cup home again for the 4th straight year. After a winter storm rolled through the area Friday evening into Saturday morning the China Peak staff diligently worked to prepare the hill for racing and eventually the day’s races were started in the early afternoon. Anthony Wildenberg of the Dodge Ridge Race Team (DRRT) was able to capture his first victory of the season in the U-10 boy’s class with teammate Tej Sulikar in 3rd place. For the U-12 boys, Dodge’s Stash Perry earned another victory by besting DRRT’s Evan Lear by .52 seconds and in the U-14 boys class Jake Kalia skied to 2nd place on Saturday afternoon. On Saturday the DRRT girls had a solid day on the race course with Meara McCarthy (U-10), Jensen Perry (U-12), and Ava Law (U-14) all finishing 2nd in their respective classes with Dodge’s Alexis Ghiglieri just behind McCarthy in the U-10 girls division. On Sunday the Dodge Ridge Race Team came out with one of their most dominating performances of the season winning 4 out of 6 classes and earning 12 out of 18 available podium spots on the day. DRRT’s skiers swept the U-10 boys class with Iain Ferguson in 1st place, followed by Tej Suklikar in 2nd and Jeremy Rosoff in 3rd. Dodge’s boys also swept the U-12 division with Stash Perry earning another win, Evan Lear in 2nd and Ethan Perry in 3rd place. For the U-14 boys DRRT’s Aidan Ferguson finished 2nd with Jake Kalia in 3rd. The DRRT girls were lead by Alexis Ghiglieri’s win in the U-10 class followed by Meara McCarthy in 3rd place while Jensen Perry finished up the weekend with another 2nd in the U-12 class and Ava Law earned 2nd place in the U-14 girls division. Sunday’s strong rally proved to be just what the Dodge Ridge Race Team needed to retain the Silver Cup at Dodge Ridge for the 4th year in a row. The final USSA Central Series race is set to be hosted by the Yosemite Winter Club at Badger Pass, March 22 & 23, and then the top racers move on to the Far West Championships at Sugar Bowl in Early April. View some photos from the China Peak race below, or ((Click Here)) if the slideshow fails to load.